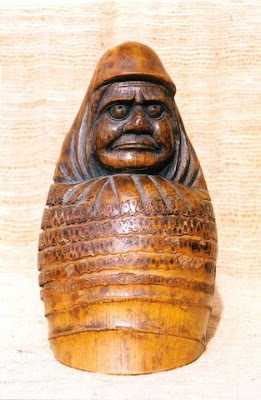 This is a common rendering of Daruma san in bamboo. Bamboo is maybe the most representative plant of Asia. The bamboo grove with the seven sages of old China 竹林七賢 has enchanted Asian art for hundreds of years. 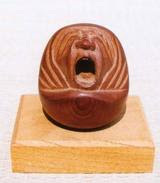 A typical Chinese carving, Daruma enjoying the spring flowers in my garden. Found at THE KURA store. A sort of spoon used to take tea leaves out of the container. They come in all kinds of sizes, here are just three of my collection. with photographs by Dan Levy and published by Weatherhill, 1970. Mark Schumacher has a fine page about Bamboo Art. Throughout Asia, the bamboo motif has been used since ancient times in paintings, scrolls, pottery, and other art forms. Below are some of my favorites. Some were scanned from temple brochures, others are digital photos of artwork I own, and some from contemporary artists showing their pieces on the web. A link to more links about Japanese Bamboo Art. "Perhaps the most distinctive feature associated with minka (literally, "house of the people"--an architectural style from the late twelfth to the mid-nineteenth century) is the thatched roof, and it is here that bamboo's contribution to Japanese architecture is first identified. As traditionally constructed, an elaborate grid system of whole bamboo poles, tied in place with ropes of rice straw (wara) or split bamboo, supported the weight of these massive roofs. Visible only from the interior, or at the edges of the eaves outside, this network formed the skeletal system of the entire roofline. Occasionally, a simple open grid of bamboo poles was also placed over the thatch and lashed in place as an additional measure to secure the thatch from above. Quite simply constructed, this exterior grid was easy to repair or replace. A whole length of bamboo, sometimes complete with root ball, was a striking ornament across a roof ridge." The information at Contemporary Japanese Bamboo Arts is also useful and interesting. "I was attracted by the tensions created by the balancing of forces: of cohesion and chaos, structure and nature, refinement and exuberance, and, ultimately, simplicity and complexity." The very nature of bamboo is ambiguous: it is a species of grass with treelike qualities; it has a hollow interior yet is amazingly strong; it is used as everything from a building material to a food. Bamboo is also mysterious: it is said to flower only once in a plant's lifetime, and then only once in a hundred years. Astonishing and poetic by nature, this uniquely arborescent plant has profound cultural significance in Japan. The oldest narrative about bamboo, written by an unknown author in the early Heian period (794-1185), tells a story of a "shining princess of gracious bamboo" (nayotake no kaguyahime). She was so named because an elderly bamboo cutter found her inside a stalk of bamboo, shining like the moonlight. The princess matured, as quickly as bamboo grows, to be a legendary beauty. At the end of the story, she returns to the celestial realm of the moon, where she had been fated to reside. At the height of the courtly culture of Heian-period Japan, bamboo inspired many poets and writers. This sensitivity to bamboo's subtle beauty and strength continued, influencing compositions of lyrical Noh drama in the Muromachi period (1338-1573) as well as the secular theater of Kabuki in the Edo period (1600-1867). Bamboo's physical characteristics of flexibility and strength were associated with a literati ideal during the Song period in China (960- 1279). The flexibility that keeps the stalk unbroken implies the invincible moral stance of the literati, and the property to split resolutely in half is associated with the quality of candor. The motif of bamboo grouped with a pine tree and plum blossoms (shôchikubai in Japanese) was introduced to Japan in the Muromachi period (1338- 1573) and symbolizes perseverance in the rigors of life. Although bamboo's association with the literati philosophy has diminished over time, it is still an auspicious sign widely recognized in Japan. As with other objects in the repository, many of the baskets are probably of foreign origin. Appreciation of Chinese baskets continued to the time of Ashikaga Yoshimasa (1436- 1490), the eighth shôgun in the Muromachi period. Tradition credits Yoshimasa for the first use of a bamboo basket for secular flower arrangement. An enthusiast for emulating Chinese culture, Yoshimasa most likely used a basket imported from China to re-enact a cultural activity prevalent there. Until the sixteenth century, baskets valued for aesthetic qualities by the Japanese were limited to those imported from China. Reflecting the philosophy and formalism of the dominant Confucianism, Chinese baskets display perfect symmetry in form and weave techniques that are regular. However, Japanese farmers and commoners had been making and using much simpler and casually woven bamboo baskets for both religious and secular purposes. The first crucial turning point in the history of Japanese basketry resulted from the codification of a Japanese-style tea ceremony, chanoyu, by the sixteenth-century tea master, Sen no Rikyû (1521- 1591). With chanoyu, particularly a type called wabi-cha or withered-tea style, Rikyû advocated an aesthetic opposite of that of the Chinese-style tea ceremony. He encouraged appreciation of unpretentious beauty in imperfection and the simplicity of daily utensils. Thus, daily baskets, often irregular in shape and weave, were welcomed for the display of flowers in a tokonoma (alcove) of a teahouse. This development in the tea ceremony led to the categorization of baskets into two styles-- wamono (Japanese things) and karamono (Chinese things). By definition, wamono baskets are either direct descendants of farming or fishing implements, or they take inspiration from the informal qualities in design and weaves of those utilitarian items. 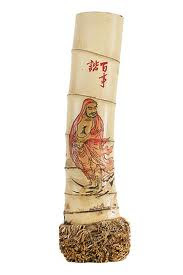 Rikyû even used a simple cut section of a bamboo stalk, the style called zundo, which was often used by commoners as an inexpensive alternative to a flower vase. In another instance, his adaptation of a creel he saw being used by a fisherman at the Katsura River in Kyoto as a flower basket stimulated creation of a new style of baskets, referred to as Katsura-kago. This incorporation of native baskets to chanoyu also affected the emergence of a new style of flower arrangement, called chabana (flowers for tea), which ultimately aims to display flowers in a state as natural as possible. are well aware of the shifting consciousness about baskets among the publicóa willingness to view baskets as art objects even as they continue to serve utilitarian functionsóand are eager to experiment with formal transformation in their creations. Perhaps, what allows basket making to escape conventional classifications of art is that the makers consider themselves to be artists and artisans, not one or the other. Ultimately, the expressive vocabulary of individual makers harmoniously coexists with the long tradition of Japanese basketry, with the organic warmth and flexibility of the material, and with our basic desire for the enrichment of our surroundings.
. . . Resources : Japanese Bamboo Baskets !
. Arima kago　有馬籠　bamboo baskets from Airma Hot Spring . It is said that Saint Kennyo gifted an Arima Basket to Nene, wife of Hideyoshi, as an Arima souvenir. The basket is also a bamboo craft which Sen no Rikyu　千利休　visiting Arima with Taiko Hideyoshi ordered to make as one of his tea ceremony’s tools. "My new Province is a land of bamboo groves; their shoots in spring fill the valleys and hills. The mountain woodman cuts an armful of them and brings them down to sell at the early market. Things are cheap in proportion as they arc common', for two farthings I buy a whole bundle, put the shoots in a great earthen pot, and steam them over the boiling rice. Their purple nodules broken, they suggest an old brocade; their white skin gleams like new pearls." Along with the winter plum and pine tree, the bamboo forms the Trio of the Winter Friends depicted so frequently in Chinese art. It represents resistance to hardship and the smooth expanse between its nodes symbolizes virtue or a long distance between faults. The hollow interior is a sign of modesty signifying the inner emptiness which is the characteristic of the scholar-gentleman who is upright in bearing but humble. Because of these venerable associations, the bamboo is the emblem of the Buddha. In India the seven-knotted bamboo staff indicates seven degrees of initiation and invocation which are rooted in wisdom and gentleness. This combination of unostentatious flexibility and immense strength is the key to understanding the natural symbol of the bamboo. They say the wise bamboo bows before the wind but never breaks, and so the wise man lays low before the storm but rises up fresh and unbroken when it has run its course. The bamboo's gracefulness and constant growth exemplify a yielding but enduring strength and pliability which the Japanese take as the symbol of good breeding, lasting friendship and longevity. The long canes reaching ever upwards represent truthfulness, while the curved branchlets and trembling leaves express a beauteous devotion. So auspicious and beauteous are the symbolic characteristics of bamboo that it has served as the most enduring motif in oriental art, and many a family in feudal Japan proclaimed at least a partial exemplification of them by adopting a bamboo design as its identifying crest. TROCADERO has a fine collection of more than 800 bamboo pieces. kaki-dake to tombo to utsuru shooji kana!
. 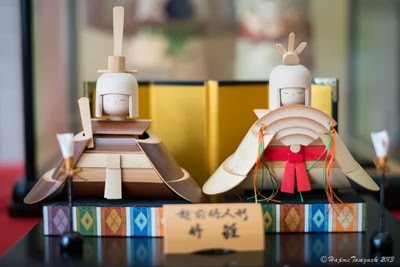 (hina matsuri 雛祭り Hina Doll festival . 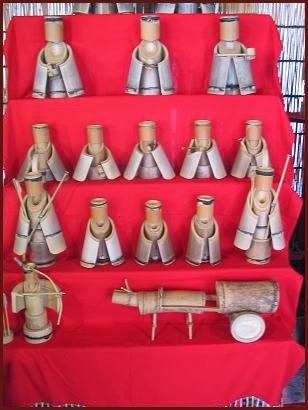 Many poor farmers prepared simple dolls from the local bamboo. Some are now rather artistic.